The Bashah pours a very dark brown hue, crowned with a healthy, creamy tan head with excellent retention. Solid rings of lacing with a very thick consistency. Body clarity is completely opaque. Initially, a milk chocolate aroma rose from the glass. Behind it, soft fruity - banana like - esters peaked through. A soft, warming alcohol presence was also noted. After the head settled, a rich hot chocolate-like aroma dominated the aroma. The chocolate reminded us of Tootsie Rolls. The initial taste has a creamy sweetness that slowly breaks down and gives way to a moderate hop bitterness towards the finish. Alcohol level is well-masked. The light to medium bodied Bashah is actively carbonated and slightly thin. The moderate hop bitter finish creates a drying feel on our tongue, then our mouths were warmed by a strong alcohol presence - but not overwhelming. Although the beer was quite dark, fruity esters were quite noticable in the finish. 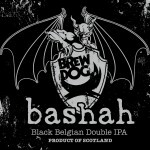 As a dark beer, the Bashah is very smooth and easy to drink. From appearance alone, one may expect this to be a heavy, meal-like beer. With the combination of malts and fruit, the complex flavors were increased when the beer started to warm up. A beer worthy of the Stone moniker, if for nothing else than its ability to expand our expectations of how a style can be morphed into something new. Reviewed on January 30th, 2010.